A “Rat Rod” is not a Hot Rod or a Street Rod and it’s for sure not a “Traditional Rod” there’s a huge difference between them all! Traditionals are purpose built machines with a very unique look and style a Rat Rod is completely different. A traditional rod is it’s own animal with it’s own roots and followings. Hot Rods can really mean anything that been juiced up. A Honda could be your “Hot Rod” A Street Rod is usually a high dollar rod. First things first lets explain just exactly where “Rat Rod” comes from. Back in the dust bowl days folks would grab anything they could and strap all they could to it and move across country looking for work, food or just escape from the dust. When these folks arrived in the big eastern and western cities folks called them “Rats” as if they had jumped ship and poured onto land. When these folks showed up in cars and trucks of all manor held together in any number of ways using any number of parts….. When these folks arrived in the big eastern and western cities folks called them “Rats” as if they had jumped ship and poured onto land. That’s how it started! As folks traveled across country the cars broke down and needed to be repaired. 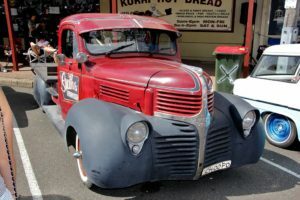 A ” True Rat Rod” is built from anything that can be used! You were gonna have to come up with clever ways of getting your ride fixed and your family back on the road again, unless you had some money which most didnt. Folks shared parts, welded parts, taped and glued parts and even hand made things as they traveled. You may have left in a Ford but showed up in a ChevOrdAllac. By the time people showed up they were driving all sorts of makes and models held together as best they could with everything they owned strapped to it. Some folks started out with cars and cut them up into trucks to haul more family and things across the country. You may have left with real seats that became tires. Now you know the real story and why a Rat Rod is a Rat Rod. Learn more about Rat Rod Bikes for Sale. Stop by Rat Man’s site where you can find out all about Rat Bikes and what it can do for you.